CCP Games on Tuesday announced the launch of EVE Online: Apocrypha, the tenth expansion for their online game EVE Online, available for Mac OS X and Windows. It’s a free update for registered users; the game is also available at retail, for the first time in years. EVE Online is a massively multiplayer online game set in outer space, where players are captains of their own spaceships. 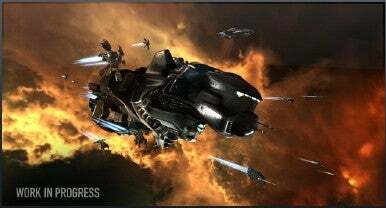 A “sandbox” environment, EVE Online leaves you free to pursue whatever sort of career you want, from mining asteroids for precious metals to commanding fleets of spaceships in epic battles. Apocrypha introduces major enhancements to the game, including a “new player experience.” EVE Online has been famously unforgiving when it comes to introducing new players to the game, and this is CCP’s first major attempt to fix that. EVE Online’s “premium graphics” are, at long last, available for Mac users with the new release. “Unstable wormholes” add a tremendous amount of new space to explore — 41 percent more, according to the developers. A new non-player character race (the Sleepers) has been introduced, and the new area grants players access to heretofore undiscovered technology and wealth. Strategic cruisers are new, along with the first Epic Mission Arc, improvements to sound and animation, a newly designed skill queue. This also marks the game’s return to retail store shelves, thanks to a distribution arrangement with Atari. The game should be officially available at stores beginning March 12, 2009. The PC and Mac versions of the game are on the same disk in the same box, which costs $35. The boxed version of the game includes some exclusives and 60 days of playable time. EVE Online remains available for download, as well. A free 14-day trial is available for download from CCP Games’ Web site. System requirements call for an Intel-based Mac running at 1.8GHz or faster, Mac OS X 10.5.6 or later, ATI X1600 or Nvidia GeForce 7300 GT or better 3D graphics with 128MB VRAM, 1GB RAM, 6.0GB hard disk space and 56K or better Internet connection.